Our goal in offering this web site to home slot car racers, is to share the benefits of what we’ve discovered to be an inexpensive way to double the number of model cars running on your home track, with longer laps and more realistic racing, than any conventional routed wood track could provide. Our AC2Car system of track design is a simple and affordable way to increase the number of cars running (non-digital)on a home routed track, with the addition of passing, blocking, and more realistic car control. The AC2Car system uses a simple AC2Car electronic circuit, you can make yourself, that allows racing with twice as many cars, on a track designed narrow enough to allow almost double the linear feet of racing than you can get with conventional tracks. The AC2Car Electronics (outlined on our Electrical page) has been proven on our tracks (see Gallery page) as an inexpensive, do it yourself, circuit that allows you to run any two regular slot cars in the same slot that are both independently controlled. This doubles the number of cars you can race without being restricted to unique digital cars. All of this can be done by you at home, with a bit of ingenuity and very little expense. 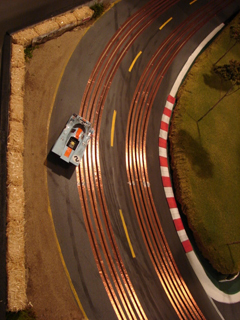 On an AC2Car routed wood track, designed using the AC2Car system’s unique slot pattern, your model car racing will rise to a more realistic level. The AC2Car system of track design allows each car an inside or outside lane to run on. Drivers choose one of two different ways to do each lap. You will be lane changing, blocking and passing with regular slot cars (non-digital) on every lap. Along with these features comes the added control that drivers get with AC2Car electronics. As we said, tracks designed to the AC2Car system also benefit from a much narrower roadway than the typical DC slot car track. This narrower scale width allows more linear feet of track in the same space, with the added strategies of lane changing. It will allow you to race more cars, for longer laps, with better control, making your home racing more realistic than ever! The best part is, with a little ingenuity you can scratch build an AC2Car track with readily available, inexpensive components, yourself. Check out our Gallery page to see our tracks. And, to learn more about making your own AC2Car track, visit the pages below to see how you can build an AC2Car track in your own home. Just like we did!